1) Lie on your side with your knees up. Reach your upper arm back and to the side while keeping your hips on their side. Hold this stretch for 15 seconds. Repeat on the other side. 2) Now roll onto your stomach. Press up your upper body so as to extend your lower back. Hold the stretch for 5 seconds and repeat 10 times. 3) Next, rise up into the 1/2 kneeling position. Holding a cane overhead, rotate your shoulders to the left and right while maintaining a tall posture. Repeat 10 times with each leg up. 4) While standing, hold a cane overhead. 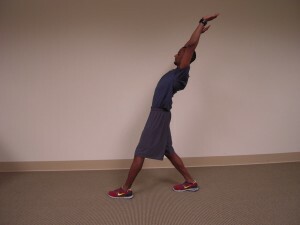 Step forward while reaching your arms up and back to stretch the front side of your body. Make your body as tall as possible for this stretch. Hold for 10 seconds and repeat 3 times on each leg. 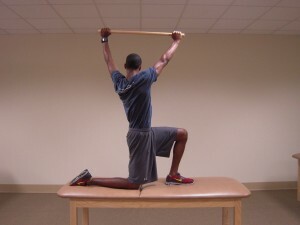 These stretches are for general back stiffness. 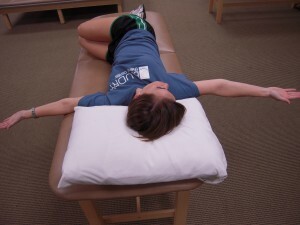 If you are truly having back pain you should seek the advise of a medical professional. 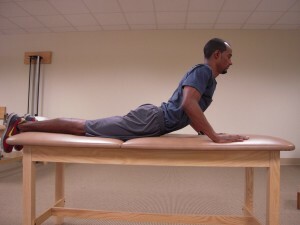 For more information on back pain and exercise, just follow Baudry Therapy on Twitter or like Baudry Therapy on Facebook. Disclaimer: The information provided on Baudry Therapy Center ’s website and blog is presented for information and educational purposes only. This general information is not intended to diagnose or treat any medical condition nor to replace diagnosis or treatment by your healthcare professional. Before beginning light or moderate intensity physical activities, we encourage you to talk with your healthcare provider about health and exercise as part of your everyday routine. Baudry Therapy Center and it’s respective agents, heirs, assigns, contractors and employee’s will not be held liable for any injury incurred or exacerbated while performing any exercises, stretches, or any other activity related to the content and information available on this website.